There was a lot of buzz in the LinkedIn world recently surrounding a Harvard Business Review story that examined the effects of business travel on a person’s health. It didn’t surprise me to read the data showed a direct relationship between the frequency of business travel and an array of physical and behavioral health risks. Don’t Forget the Workout Wear: Whether you hit the hotel fitness center or bang out some burpees in your room, gym shorts, yoga pants, a couple of sports bra and pairs of socks all roll up into practically noting in a suitcase, even if it’s carry-on. So there’s no excuse not to take them along on the trip. Pack Healthy Snacks: Along with the workout gear, you’ll always find a few small bags of raw almonds, and enough KIND snack bars and Isagenix IsaLean shake packets to last the duration of the trip in my suitcase. No matter how long I’m on location, I know I can start the day with a nutritious shake and when hunger hits later, I’m armed with good snack options. Make Smart Choices: As someone used to 2am wake up calls for a 4am start and wrapping 16 hours later, I know how tempting it can be to go a little crazy with food as a “reward” for a job well done. While there’s no reason not to treat yourself, keep track of your portion sizes and perhaps choose to have a cocktail, but skip dessert; or skip an appetizer and a drink but indulge in something sweet after your meal. If you have to attend a client dinner or lunch, try the ever-other-drink rule for the duration of the meal. Start with a glass of wine or cocktail and then make your next drink water or seltzer. This way if you make it to the third drink, it’s only your second libation instead of a third. I realize I’m a mini-business traveler compared to the true “road warriors” like my fiancé who has clocked hundreds of thousands of airline miles in his lifetime thanks to work. I do understand, however, how hard it is to feel “normal” again after just a few days on the road, let alone a week or more at a time. So the struggle is definitely real. 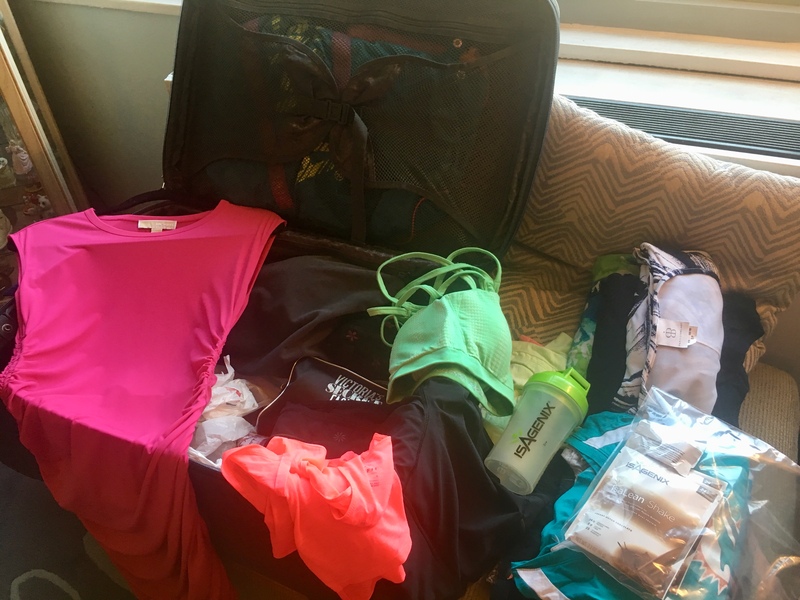 But sometimes a little planning and adding a few healthy items to your suitcase for that time on the road is all you need to do your best to stay on track with your plans to have fun, be fit and feel fabulous! Posted on June 18, 2018, in Fitness, Health, Nutrition and tagged Body Weight Exercises, Crunches, Healthy Snacks, Healthy Tips for Business Travel, Hotel Fitness Center, Isagenix, KIND Snacks, Lunges, Motivation Monday, Personal Fitness, Squats. Bookmark the permalink. Leave a comment.